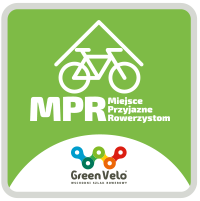 It’s our pleasure to inform you that Stara Szkoła has the MPR recommendation by Green Velo on Eastern Poland Cycling Trail, which stands for the recommendation of a Cyclist-Friendly Place. This means that we have positively passed the verification procedure conducted by the auditors of the Green Velo Trail. What they checked was our “friendliness towards cyclists”. The offer of Stara Szkoła also includes services dedicated to tourists on bikes.